This book was an impulse buy from the Kindle advertisement. What can I say? 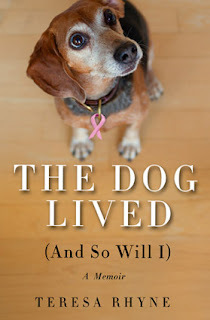 The cover art was good, I loved the name, and I am a sucker not only for animal themed stories, but also for cancer themed stories. I know this sounds weird, but when I was about ten, I picked up a book by an author named Lurlene McDaniel who writes about young adults struggling with mortality and chronic illness. I was hooked. This book married these two strange obsessions into one nonfiction story and I have to be honest when I say that this is the first book I have read with such consistently in months. I think it’s that peering into these intimate moments of illness make me somehow less afraid to face my own life. I think. So, I have to start the official review portion of this post by saying I loved this book. Based off of Rhyne’s blog of the same title, this book serves as proof that blog author DO get book deals. (hahahahaha!) It was well written and it just goes to show that sometimes life is divine. The author’s life is cosmic in the ways in which is tied to her magical dog, Seamus (pronounced SHAY-MUS). Anyone who has ever owned a dog who was a little bit special knows that they are just worth every ounce of love, money, and time we pour into them. I have a new appreciation for this after reading this book. I also have a new appreciation for those struggling with cancer--one that all those Lurlene McDaniel books apparently never gave me year ago (no offense, Lurlene!) The way Rhyne tells her story is brilliant..she connects her life similarly to the way I feel I connect mine, so it all made sense and it awakened within me a sense of realism to something I hope I never really have to understand. And oh, her boyfriend Chris. This guy. I mean THIS GUY. He’s great and very real and not without his own complications. But the way she writes about her life, well, I just loved it. The author has a real tone, a real story, and it packs some major inspiration. Whether or not you know someone who has suffered with cancer or not, this book holds great meaning for all our lives. It is a story about survival and pets and boyfriends and all the things (like love!) that make life worth living. This book, ladies and gentlemen, is why I will never own a Kindle that doesn’t display advertising! I love finding gems like this and I hope you will check it out and consider giving it a read.